Amanda came to me with an interesting concern. She was reading romance novels. Nonstop. And every time she did, she felt like crying. Because her relationship was so far from the love depicted in those pages. Amanda and Gary had been together 5 years but had known each other much longer. Amanda loved Gary very much. Being in a long-term relationship suited her. She took great pleasure in looking after Gary and making their life together fun. But Gary didn’t exactly return the favor. He was a good man and a hard worker, but romance wasn’t built into him the way it was built into Amanda. He was happy sitting on the sofa chilling out every night. He didn’t really care if they went out or if Amanda made him something special or if she dressed up for him. But I also know what it’s like from a man’s perspective. Not all men know how to be romantic storybook heroes. Wanting your guy to be different is completely normal. I don’t think anyone gets through a relationship without wishing they could tweak some of their partner’s more annoying traits. But love asks something else of us. A treasurer is a very particular kind of man. You can spot him by how he treats the people and things he values. He treats them with loving care. Maybe it’s a younger sister, or maybe it’s a shiny pickup. Maybe it’s a gadget he spent a fortune on or a guitar he’s had since he was 13. Treasurers take care of what they love, because they feel responsible for the riches they’ve been blessed with. Contrast that with the guy who takes what he has for granted. He’s always interested in getting more. But once he’s got it, he doesn’t look after it. Why should he? It’s his now. He can treat it however he likes. Treasurers have a different perspective. What they value most is not the things they own or the people they love. It’s the relationship they have with those things and people. A treasurer doesn’t treasure the woman he’s with as much as he treasures the love he shares with her. He knows not to take her for granted, but even more importantly he knows not to take their love for granted. Would you say you’re a treasurer? Do you take responsibility for the quality of love in your relationships? I suggested to Amanda that (even though it’s not fair) it might be easier to change herself than Gary. 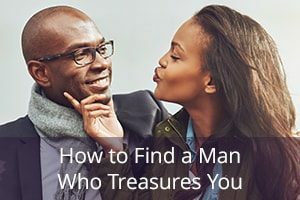 Could she work on treasuring their love, rather than just being a good girlfriend? “Maybe your love has different needs,” I said. What makes your love flourish? Whatever it is, do more of that. It’s a simple idea that works. James, Do you have any useful information on being engaged to a narcissist? My situation is beyond pathetic and I need some insight. Agreed with James. As a woman who’s been there and done that – get unengaged! Get out. It ended with police intervention and time in the hospital for me. He does love me as much as a narcissist is capable of loving and at times I could see he understood things weren’t right with him or us but he never acted on it. He chose to continue making me the reason everything was wrong because he was/is incapable of seeing his own brokenness. Two years later I still on occasion hope he’ll see the wrongness of his actions, seek treatment, become a new man and come running back to me. I’m not holding my breathe, I’m loving him from afar and letting him go and looking for new love. Leave your narcissist behind. Be careful doing it. I created a wound and was punished. You aren’t going to change him. Not ever, he doesn’t see any wrong in his behavior. Stop trying. Flee! Run. Escape, but do it passively and don’t trigger him. It hurts.